Planet Gibbs enters Twitter Universe. 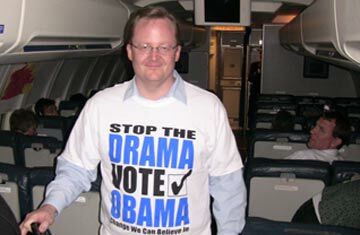 If White House Press Secretary Robert Gibbs has decided he’s going to offer up his unique blend of unpreparedness with unwarranted self-esteem on Twitter, then it appears I now have no choice but to begin chronicling it all here. Personally, I pine for the days of Arie Fleischer. He was like this brilliant little sock monkey who could smack down Hellen Thomas’ inane questions at will. He enjoyed a good intellectual joust, but he was an affable guy. Tony Snow was great, but he was like a Press Secretary Superman. I loved the guy, and he was an ideal Pres Sec, but I like my heroes with a few minor flaws in them, which is probably why I’m more of a Batman kind of guy. Tony Snow was a great guy. I’m not really an emotional guy, but I found myself tearing up when I found out he died. It’s rare that you find someone with so much talent who’s also filled with tact and grace at all times. The way he handled himself through his illness was inspirational.